The drunk driving numbers were, however, overshadowed by the 7,600 cases of speeding registered across Mumbai on Sunday. The cases of driving under the influence of alcohol in Mumbai on New Year’s Eve went up marginally from 567 cases last year to 615 this time around. The drunk driving numbers were, however, overshadowed by the 7,600 cases of speeding registered across the city on Sunday. While the Mumbai police collected Rs 12.3 lakh in fines for drunk driving, e-challans worth Rs 76 lakh were issued to offenders in one night. As per the Mumbai police, the e-challan system connected to the nearly 5,000 CCTV camera network across the city has helped them book more violations as compared to the past. Apart from drunk driving and speeding, there were 4,000 ‘other miscellaneous cases’ registered, including riding without helmet and parking illegally. A senior official from the traffic department said that they had collected Rs 12.3 lakh in drunk driving and challans worth Rs 76 lakh were issued for speeding. “However, since it is a CCTV remote challaning system, the entire amount – Rs 76 lakh – might not have been collected as yet,” the senior officer said. Deoraj ascribed the rise in the number of drunk driving cases to a higher vigilance on the part of the Mumbai police. The number of drunk driving cases over the years have seen a fluctuating trend. While in 2012, there were a total of 838 cases registered, the number came down drastically to 568 in 2013 and 523 in 2014. The number rose to 705 in 2015 and dropped to 567 last year. Deoraj added, “So far no incident of any fatal accidents have come to light. Also there were no incidents of sexual violence reported on the 31st.” A total of 30,000 personnel of the Mumbai police were on the streets on the New Year’s Eve, to ensure that things went smoothly. Leaves of all officers had been cancelled and senior police officers of the force had been asked to stay on the roads to avert any untoward incident. Meanwhile, the Thane traffic police registered 1,900 cases of drunk driving in last three days. Out of these, 1,300 cases were registered on December 31, police said. With 434 drunk driving cases, the Navi Mumbai police recorded on the their highest figures. 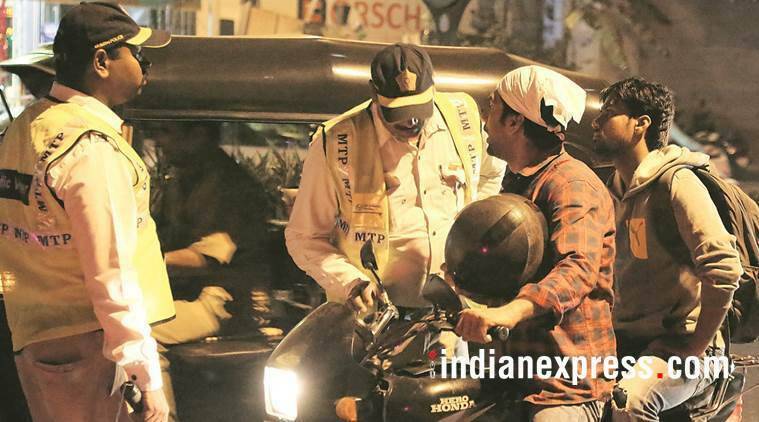 According to the figures released by Thane traffic police, between December 29 and December 31, they collected Rs 28 lakh in fine in drunk driving cases. “We had put various checkpoints throughout the city and our men were checking through the day. We stopped around 1,900 drivers who were inebriated and fined them,” said traffic DCP Amit Kale. Similarly, Navi Mumbai traffic police stopped around 434 drivers, who were driving under the influence of alcohol.